Hello & welcome back to URComped’s Top 5 Slot Jackpots of the week. April 21st, 2019 edition. Let’s get right into our #5 spot of the week. This game is hitting the slot world by storm as of late. It has very similar features similar to the popular Lightening Link Slots making it very popular to play in casinos. Great job on achieving our 5th place Slot for this weeks Top 5 Slot Jackpots Of The Week. Great to see you again VegasLowRoller. 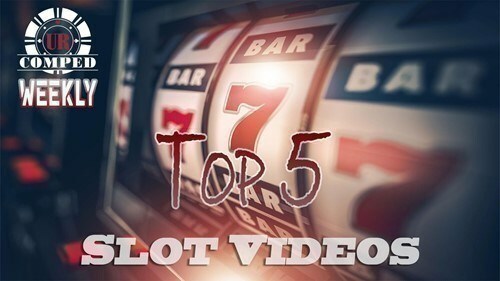 It’s been a while since we have had you in our top 5 Slot Jackpots of the week but this video sure does deserve some video cred. That Buffalo Deluxe version is one of my favorites to play as well since you can score huge on lower bets. Those 5x multipliers really help, don’t they? Congrats on taking 4th place this week bud. Another mighty cash jackpot but this time it’s the Outback bucks version. Showcasing Slot Machine Win’s By Chico this time though. Hoping lots of people will subscribe to your channel as you have some great content and awesome live feeds. I’m glad to showcase this video for you as I watched it live when it was happened. Your .10c denomination and $7.20 Bet was so cool to watch live. Congratulations on earning #3 this week. This game packs a powerful punch. Old school IGT meet Mr. JFK SLOTS. JFK showing us how it’s done on his 1 credit $100 Bet. And for this, you received our top award for the week in our top 5 Slot Jackpots of the week. Hope to see more from you soon. Good luck! Typical old school IGT Cleopatra II with the increasing multipliers. This game is so volatile. We have been seeing many weekly Jackpots on this game as of recently. This game is so unique with its random bonus feature with progressive Jackpots. Dianaevoni landed the minor on her third spin. That was truly amazing to watch. Good Job!! This is an update reel slot with some flare. It has a box top bonus like feature which is really neat. The increasing multiplier on this feature helps out a lot with the jackpot amount when playing it at the dollar denomination. This lock it link game is one that I have got to try out. Plays out a little bit like Eureka Reel Blast but with pigs. Playing this in high limit denominations and getting a full screen of a pig to spin must of been exhilarating. Nice job on earning #1 this week. Hello & welcome back URComped fans to this weeks great edition of URComped’s Top 5 Slot Video Jackpots of the week. This week we have some incredible wins and we also showcase the “Lightening Links”. Let’s get started with our # 5 pick of the week. Lightening Link is taking the slot community by storm as of late. Seems like everyone can’t get enough of these games. The two features pack a punch especially playing High Limits. The anticipation of getting those 6 balls to drop and hold to start the feature will keep you on the edge of your seat. Part of the lock it link series of games this one seems to be a fan favorite lately and certainly treats you well Newenglander82 SLOT VIDEOS. Your dynamites perfectly aligned up for you right from the get go. Another lightening link jackpot. WoW!! Good choice playing this at the .50c denomination, $25 per pull. It really paid off for you in a big way this week. Those were some massive balls that dropped for the feature. Another fine jackpot MGSlots. Going to start nicknaming you LLSlots for Lightening Link Slots. This is your game. I’m glad you made this weeks Top 5 with your massive jackpot. That ball feature is so much fun to watch. Congratulations on earning our top spot this week in our top 5 Slot Video Jackpots of the week. Cleo II is a classic old school IGT High Limit Slot that has an insane amount of volatility. Betting $40 a Spin with the increased multipliers really helped boost this win up for you. Awesome Win!! Denomination = $10.00 Machine, $30.00 Bet. This is an old school classic reel slot that has been reinvented on a new style cabinet. So much fun to play. Getting the pinball symbol on reel 3 gets you into the pinball bonus which is similar to top dollar but in this case you get either 4 shots or 5 shots at winning credit prizes. This game is so much fun to watch and play because it plays out a lot like FuDaLo with its magical black screen and amazing bonuses. RG Slot Won though got a beautiful line hit which nailed him this $1,600.00 hand-pay. What makes this game so unique and special is that for one, it’s an old school classic WMS video Slot which is extremely hard to find in any casinos anymore. Amazed that Brent can still find it, let alone play it and then hit a major handpay on it. Good Job! Glinda came out and spread those wild reels for you in the most perfect spots. What makes this game so unique and special is in the Buffalo Gold feature where you can collect up to 15 Buffalo Gold heads which in the bonus they become the actual Buffalo head symbols which pay the most. This game is extremely volatile. Welcome Back URComped Followers To A New & Exciting Edition Of URComped’s Top 5 Slot Video Jackpots. To Start Off 2019 With A Bang, We Have Some Great Hand Picked Videos For You. Few Monster Hits In This Edition. ENJOY! What makes this game so much fun to play and so unique is within the bonus. I love how you can get that black screen randomly and you just know your win is going to be a monster or a progressive. The anticipation is an awesome feeling. This is your go to game SlotWinner. This is your game Dejavu Slots. You guys seem to nail this one time and again. The massive amount of spins you guys get is just impressive and that is what makes this game so special to play and on High Limits too. WoW EZ, that was impressive. I love these super old school bally cabinets that have so much volatility. Congratulations on an impressive win. Another super massive win by MG Slots on Golden Century. This game plays out a lot like Lightening Links which are so popular right now in all the casinos and cruises nationwide. Getting that ball feature is so much fun to get. Can’t believe you nailed a $12,500 ball. WoW!! Congratulations on earning the top spot this week in our top 5 Slot Video Jackpots of the week. This game has so much volatility and you playing it at a $5.00 denomination, $100.00 Bet is massively impressive. Getting those retriggers helped out a little, didn’t they? I just love watching the multipliers add up after every spin. Welcome Back Gang To Our Christmas Edition Of URComped’s Top 5 Slot Video Jackpots Of The Week-December 23, 2018. Hope Everyone Had A Great Holiday & Is Gearing Up For The New Year! We Wish All Of You A Happy New Year, & Best Of Luck In The Casinos. Let’s Get Into Our Top 5 Now With #5. Denomination = .10c t drop on every spin the more chances of getting that full screen to land the top progressive award. What makes this game so unique and special is in the bonus round when the dragons come out randomly to create beautiful line hits. Playing this game in a high denomination is risky but can be rewarding. Good job BC Slots for making the top 5 again three weeks in a row. This game is total volatility x 100. Wow! Not a bad win for only betting $2.00 a Spin. It was so nice to see those triple stars land one by one. Old school IGT right there. This is one of my favorite games to play because the bonus is amazing with all those sticky wilds and in this case landing the major jackpot randomly. Congratulations on winning and landing the top spot this week in our top 5 Slot Jackpots of the week award. What makes this game so unique and special is in the bonus round when you collect chili peppers to make the screen can change from 2 screens up to 8 screens and more. In Newenglander82 SLOT VIDEOS case, he ended up with 8 screens of bonus play on a $8.00 bet landing him this nice jackpot. Another fine video by BC Slots. Quick Hits is your game. Landing those 4 quick hits and 5 quick hits really help boosted your total bonus amount up. $27.00 bet, not too shabby either. What a comeback East Coast Slots! WoW! Thank goodness for Lightening Link coming through. Always enjoy following along with your documentary videos. So fun to watch! What a hand-pay SlotWinner. On a $10 bet, you really nailed it with all those multipliers adding up and scatters/retriggers. You take 2nd place this week in our top 5 Slot Jackpots of the week award. This is a fan favorite lately amongst the slot community with its ball featuring which is very similar to Lightening Link. MGSlots21 nailed the elusive $7500.00 ball which gave him this major jackpot of $8,352.00 giving MGSlots21 the top award in this weeks Top 5 Slot Jackpots Of The Week Award. Congrats! !